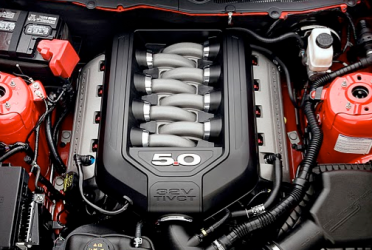 Ford recently announced that the 5.0L V8 engine is back for the 2011 Mustang. You may remember the 5.0L from the the days when your hair was a bit longer, and your jean jacket was the coolest thing in town. Back in the 1980’s the big bad Ford V8 had about half the horsepower of what the automotive world is receiving in 2011. Yes, Ford is claiming 412 hp, and 390 ft lbs of torque. It should be scary to say the least. www.Burlappcars.com has the photos to prove it. Well done Ford, it’s a great looking engine so far, hopefully it holds up to abuse like the last 5.0L did. The 2012's will have the 'ecoboost' direct injection system grafted on. Old Hemi’s in the woods. Now that’s unique.